If your workout includes bouts of tough, heart-rate-revving work interspersed with very little rest it becomes “metabolic.” That means you ramp up the amount of calories you burn during the workout and maximize calorie burn after the workout. 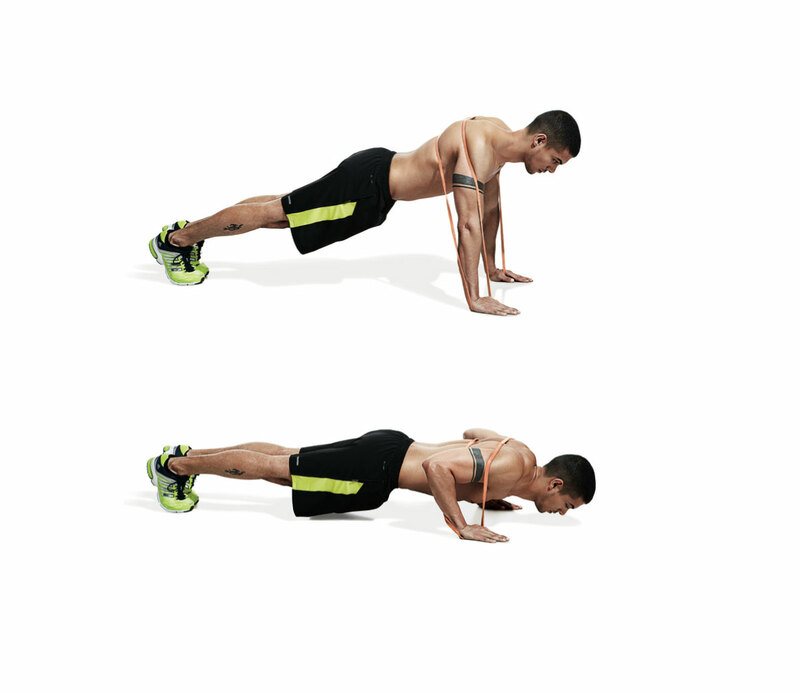 Note: It’s best not to plan high-intensity resistance training on back-to-back days. You don’t want to exhaust or overtrain your muscles (which will take vital energy away from your workout anyway). You want to give your body enough time to recover, so plan to do this metabolic circuit two to three days a week with lower-intensity cardio or strength training in between. Always factor in your fitness and comfort level when gauging the frequency and intensity of your workouts. How to do it: Assume a half-kneeling position so you’re a few feet away from a wall. (You want to be parallel, not facing it.) Your right leg is kneeling on the ground and your left leg is “up” (foot planted, knee at 90 degrees like an exaggerated lunge). 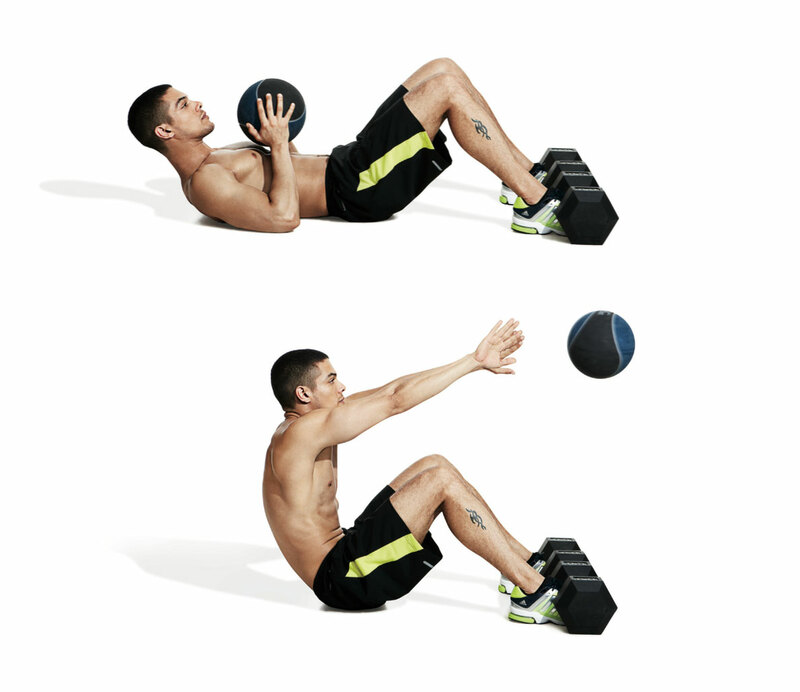 Hold the medicine ball down by your outside (right) hip, then twist left and throw the ball against the wall. Catch and freeze a bit before lowering back down toward your hip. Throughout the exercise, focus on putting the majority of your weight on your inside leg (the one closest to the wall) and keeping it as still as possible. Keep your core tight and back tall to protect your spine. How to do it: Stand so the resistance band is anchored against your right hip. Crouch down so you’re low to the ground and bring your hands up. Side shuffle out to the right, working on your speed and explosiveness, then lead with your left leg on the return as you shuffle back to the starting point. You can even work on deceleration by squatting and touching the ground as you come back to really target your glutes. How to do it: You can set this up one of two ways. (Here’s a tutorial.) Option 1 requires a heavy dumbbell and two skinny resistance bands. Loop one band through itself and cinch down to secure an end to the handle of a dumbbell. Repeat this step on the second band. Stand with the dumbbell between your legs (it should be parallel to your feet). Step both feet through the resistance bands and loop both ends over either shoulder. Option two only requires two skinny resistance bands. Create an “X” pattern with the bands. Step on one band with your right food and loop the other end over your left shoulder; then step on the second band with your left foot, looping the other end over your right shoulder. To make sure the bands stay in place on your feet, double up the loops, wrapping them once more around the front of your feet. How to do it: With a resistance band around the front of your hips, walk forward to build tension. Lean forward against the band and work explosive high knees so you’re effectively sprinting in place. Make sure you pump your arms through the movement to help drive your knees, and land on the balls of your feet.